We use third-party analytics tools to help us measure traffic and usage trends for nosynation.com. These tools collect information sent by your device or our site, including the web pages you visit, add-ons, and other information that assists us in improving the site. We collect and use this analytics information with analytics information from other users so that it cannot reasonably be used to identify any particular individual user. Like many other Web sites, nosynation.com makes use of log files. Log file information is automatically reported by your browser each time you make a request to access (i.e., visit) a web page or app. It can also be provided when the content of the webpage is downloaded to your browser or device. When you use nosynation.com, our servers automatically record certain log file information, including your web request, Internet Protocol (“IP”) address, browser type, referring / exit pages and URLs, number of clicks and how you interact with links on the Service, domain names, landing pages, pages viewed, and other such information are not linked to any information that is personally identifiable. We may also collect similar information from emails sent to us. The information allows for more accurate reporting and improvement of the site. The cookies store information about visitors preferences, record user-specific information on which pages the user access or visit, customize Web page content based on visitors browser type or other information that the visitor sends via their browser. Nosynation.com has no access to or control over these cookies that are used by third-party advertisers. Google’s advertising requirements sum up Google’s Advertising Principles, which are used to provide a positive experience for users. For more information about their policies, see here. 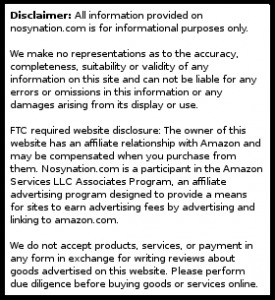 Nosynation.com is a participant in the Amazon Services LLC Associates Program, an affiliate advertising program designed to provide a means for sites to earn advertising fees by advertising and linking to amazon.com. Nosynation.com has an affiliate relationship with Amazon and may be compensated when you click an affiliate link and make a purchase from Amazon. Nosynation.com does not knowingly collect or solicit any information from anyone under the age of 13. Nosynation.com is not intended for use by people who are younger than age 13. Do not use the site if you are under 13. If you have additional questions, feel free to use the Contact Form.